1824 John Going Sr to Eliz Cockram 20 acres on Tinkers Cr and state line. 1847 Josiah Cox to James Going 30 acres adj Ralphs Branch, Adams, James and Burrell Goings lines. 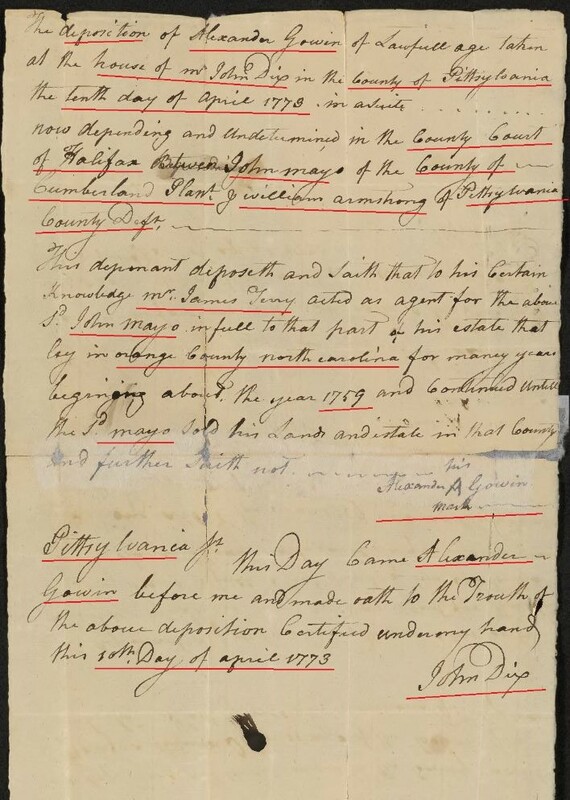 3 Tithes, Land 272 Pittsylvania Co, Va.
1771 – Deed: Daniel Gowin 270 acres to George Deathrage, 1771, Pittsylvania, Virginia, USA. 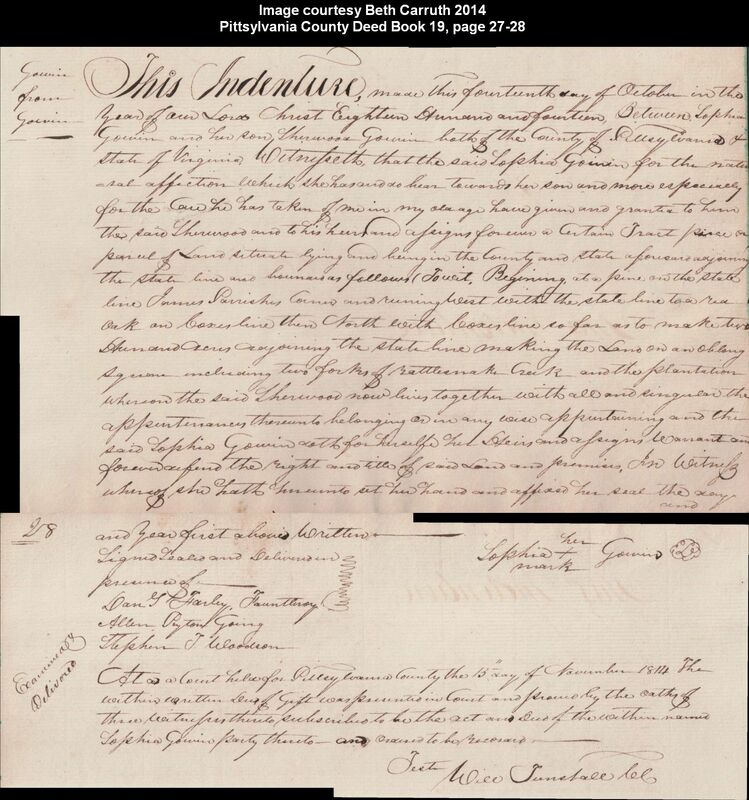 Daniel Gowin of Pittsylvania Co., VA to George Deathrage of Surry Co., NC, 270 acres in Pittsylvania Co., VA., on Russel Cr a branch of Mayo in current Patrick Co., VA (about 61 mi west of Moons Creek and Dan River in Caswell Co., NC). Pittsylvania Co., VA. Deed Book 3, p. 48. 1773 April 10: The deposition of Alexander Gowin of lawfull age taken at the house of Mr. John Dix in the County of Pittsylvania the tenth day of April 1773 in a suite . . . . now depending and undetermined in the County Court of Halifax between John Mayo of the County of Cumberland, plantr and William Armstrong of Pittsylvania County, deft. . . . The defendant being Summoned and not appearing (although solemnly called) the Plaintif made Oath to his Account for Two pounds two shillings ~ Judgment is therefore granted him against the said defendant for the same with Cash. 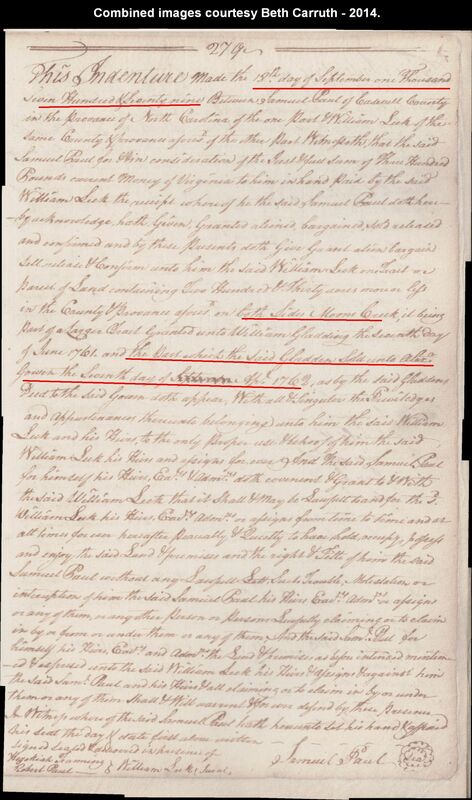 1782 July 16 – Page 45; At a vestry held for Camden Parish at Pittsylvania Courthouse on Tuesday, the 16th day of July 1782 for laying the parish levy—Present JOHN WILSON, ABRAHAM SHELTON, JOHN PARKS, JERE. WHITE, LODOVIK TUGGLE, THOMAS TERRY, JNO. BUCKLEY, & JOSHUA STONE, gent. Vestrymen. 1782 July To JNO. GOWEN to be held out for his subsistence at the discretion of JNO. WILSON, gent. – 500 lbs. tob. Virginia Census – Head of household with 11 white and 8 black. Pittsylvania Co – pg 41. 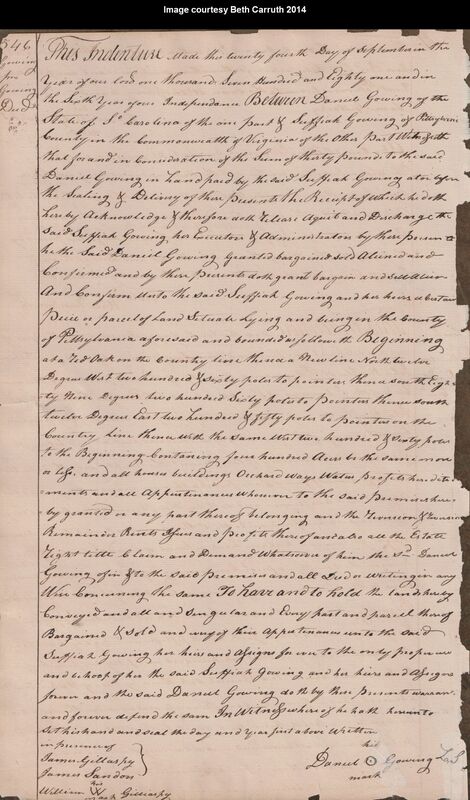 1783 May 20 – Page 46; At a vestry held for Camden Parish at Pittsylvania courthouse on Tuesday, the 20th of May 1783 for laying the parish levy—Present JOHN PARKS, ABRA SHELTON, JERE. WHITE, THOMAS TERRY, LODOWICK TUGGLE, JOHN BUCKLEY, JOSHUA STONE, & ARMISTEAD SHELTON, gent. 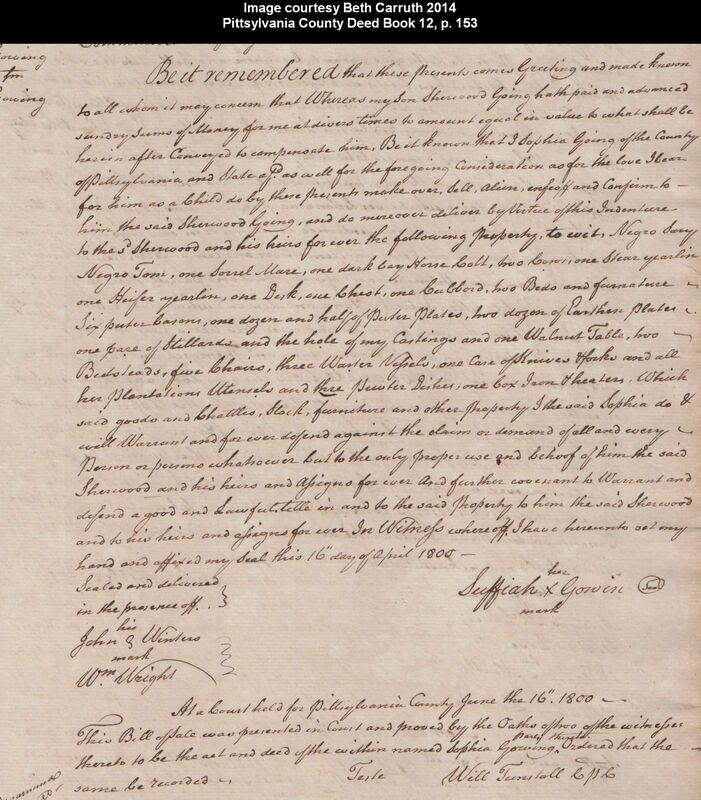 1784 Feb 18 – Page 47; At a vestry held for Camden Parish at Pittsylvania Courthouse on Wednesday, the 18th day of February 1784 for laying the parish levy—Present JOHN WILSON, BENJAMIN LANKFORD, HAYNES MORGAN, JOHN PARKS, ABRAHAM SHELTON, JOSHUA STONE, & ARMISTEAD SHELTON, gent. To JOSEPH FARGUSON for services done JAMES GOWING 75 lbs. tob. 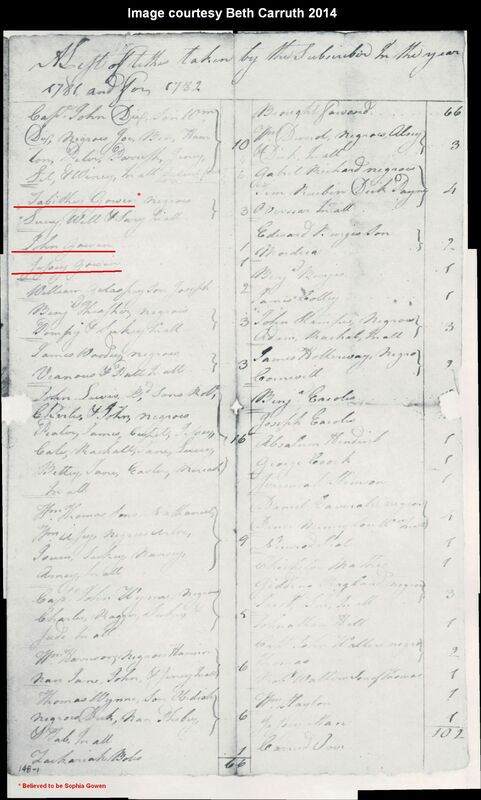 Virginia Census – Head of household with 12 white. 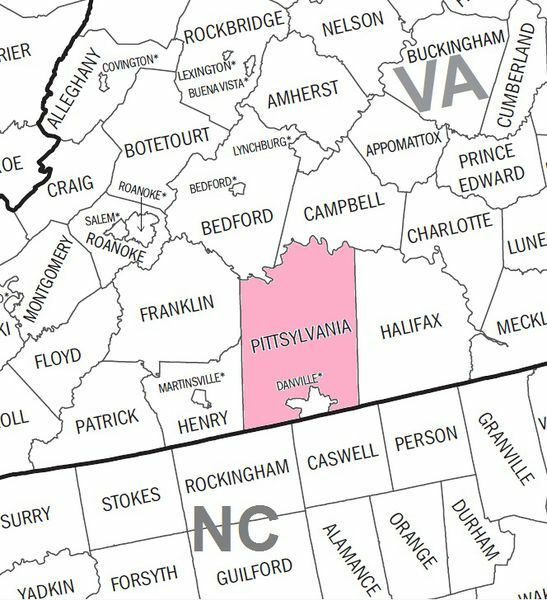 Pittsylvania Co – pg 100. 1785 Feb 25 – Page 49; At a vestry held for Camden Parish at Pittsylvania Courthouse on Monday, the 25th day of February 1785 for laying the parish levy—Present BENJAMIN LANKFORD, WILLIAM HARRISON, JOHN PARKS, THOMAS TERRY, ABRA SHWLTON, JOSHUA STONE, LODOVICK TUGGLE, JOHN BUCKLEY, & ARMISTEAD SHELTON, gent. 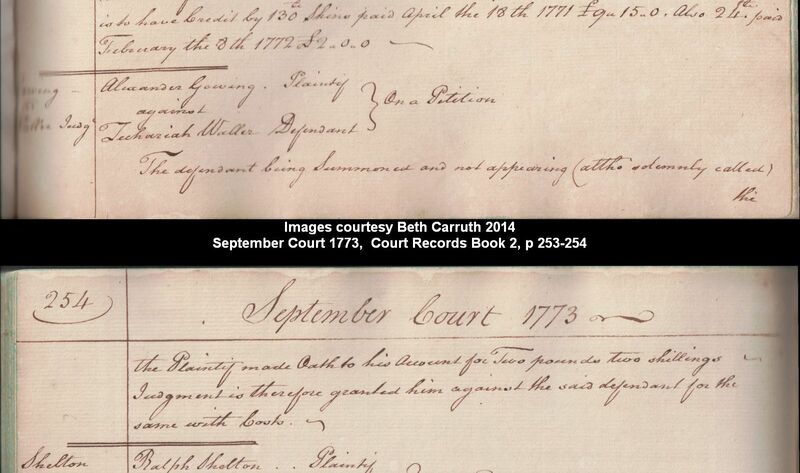 1785 Dec 19 – She was called Seth Gowing when the deed was proved in court on 19 December 1785. WILLIAM HARRISON, ROBERT HARRISON, THOMAS SMITH, WILLIAM WITCHER, JOHN SMITH, BRYAN W. NOWLIN, JOHN STAMPS, CREED TANNER, CHARLES LEWIS, JR., DAVID HUNT, ISAAC CLEMENTS, & WM. WILKINSON. DAVID HUNT, gent., is chosen President. ; CRISPIN SHELTON, JR., is appointed clerk. 1792 Sept 3 – To Nanney Going, to be deposited in the hands of William Wilkinson for her use 6.5 lbs. Camden Parish vestrybook, Pitsylvania Co, Va.
DAVID HUNT, WILLIAM HARRISON, THOMAS SMITH, WILLIAM WITCHER, JOHN SMITH, BRYAN W. NOWLIN, CREED TANNER, CHARLES LEWIS, JR., and WILLIAM WILKINS 9sic). DAVID HUNT, ISAAC CLEMENT, BRYANT WARD NOWLIN, ROBERT HARRISON, THOMAS SMITH, WILLIAM WILKINSON, & CREED TANNER. DAVID HUNT resigned as President, and ISAAC CLEMENT is appointed instead thereof. 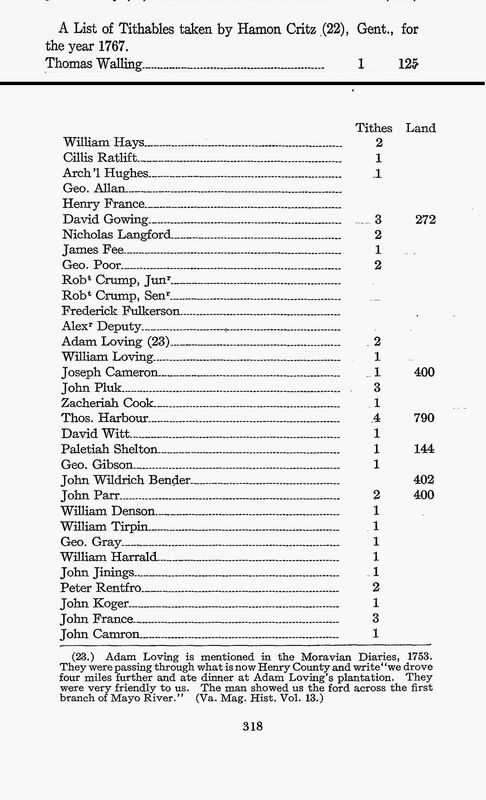 The county is to the following claimants made dr. for the year 1794. 1794 Sept 1 – To Nanney Going, to be deposited in the hands of William Wilkinson for her use 8 lbs. Camden Parish vestrybook, Pittsylvania Co, Va.
1841 Jan 21 James R Going and wife Eliza J his wife of Halifax County, Va of the one part and Harden Watson and William Watson of Henry County Virginia of the other part. 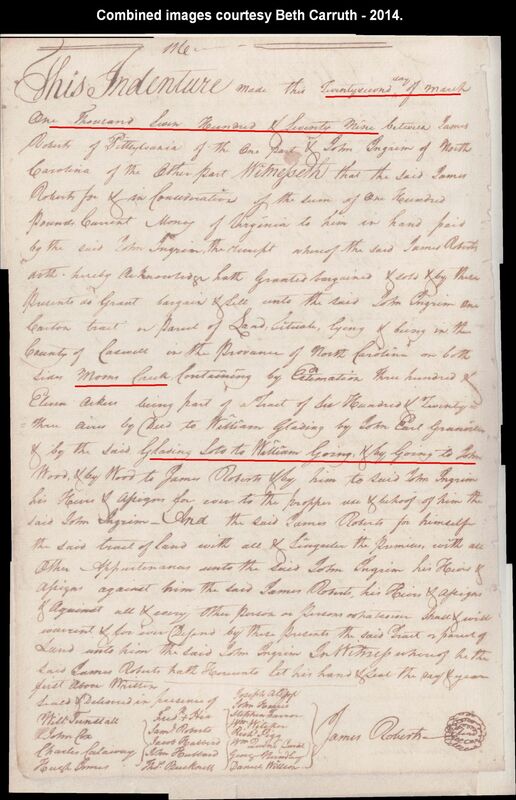 James R Going and Eliza J his wife sell a tract of land on Sandy Rier containing 220 acres bounded by Robertsons line, Petty’s line. Signed: James R Going, Eliza J Going. Wit: S M Thornton, Stinson Watson, George W Bell. Pittsylvania Va bk 44 427.